Wow, almost a full week from my last post… sorry I’ve been MIA my lovelies… Life just got a little bit interesting real fast. craft room of my very own. What is my Dream Space, you ask? Well, its exactly like the look and feel of my blog. and filled with all my beloved vintage treasures. print will have a place of prominence in my dream room one day. I fell in love with it all over again when it arrived in the mail. 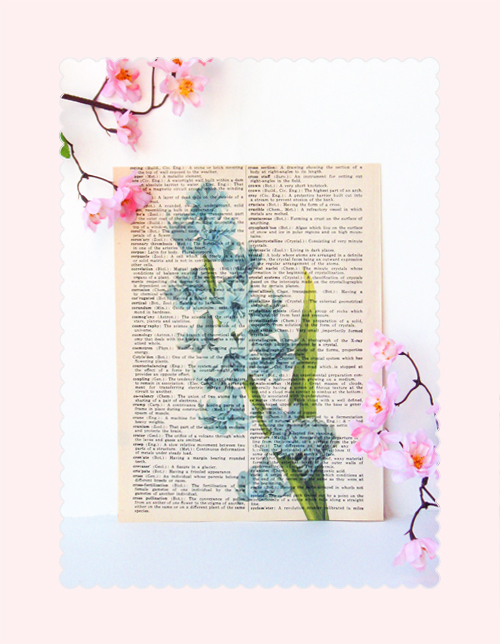 Gorgeous vintage Images Printed on authentic vintage dictionary paper with just the right amount of dreaminess…Totally L.o.v.e it. Whats your dream space like? What a beautiful print indeed! I wish you have your dream room soon! It is absolutly beautiful! I day dream of beautiful pink Dogwood trees in my year, maybe someday! I can totally envision it! My dream space would be a big office with dark wall to wall shelves and cabinets for books and storage. On one side would be my actually office space and the other would my creative space. One where i can actually set up my sewing machine! It would really rich and masculine looking with beautiful granite tops! Greetings from Spain and from Sra. Bogalusa Blog! beautiful print! hope you are having a great week! Hi Love your blog.. Everything is always so gorgeous. You have been nominated for the versatile award. Peek here. I recently changed my cherrished creative space to reflect me. It is a haven where I can go to create, work, dream, and yes, make my dreams come true! It was challenging because of size, budget, etc… but I did my best with what I had to work with and I love it! I am an artist and crazy for color- so I needed lot's of color to be stimulated that way. I also am a writer and I publish an online women's magazine, so I needed a space for writing that was a bit more peaceful. I painted my ceiling and two walls sky blue and added glitter to the paint! Dreamy! The other two walls are bright pink with sparkles! Love! I created a writing niche in an old wardrobe and painted it a soft yellow, with the inside Robin's Egg Blue. It all works for me. Follow your bliss! Find a way to turn your dreams into reality, and claim a creative space just for you!